Spring is in the air! I have my tulip quilt finished and ready to go in the local quilt show next month. We finally have green grass and a little less mud. I think this has been one of the muddiest springs we have had. I have had tulips in my garden but the gophers have gotten to them and most are gone now. The quilt will have to do. This quilt pattern is from the book Quilty Fun. I still have many more tulip blocks I can use in another quilt. 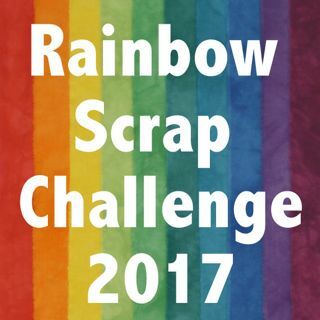 I made many of the tulip blocks as part of the Rainbow Scrap Challenge over the past few years. I have added this post to Finish Up Friday at Crazy Mom Quilts. Another photos on a fence rail, this time with the wind behind the quilt. Also behind the quilt is my black lab and the 5 horses in the distance. I did some fussy machine quilting on the tulip block. Lot of little spirals and some ditch work and then some flowing lines to follow the leaves and tulip petals. It did mean I changed the thread some 30 times or more. My backing and binding show off here. I had some lighter coloured fabrics that I thought looked good with the front of the quilt. The wind was a problem for photos today. I took lots and most look like this photo, flapping so badly you can not see the quilt. Yet somehow I like a few of these photos. It makes the quilt come alive. The quilt show I plan to put this quilt in is the Edmonton and Districts Quilt Guild show. The Quilt show is June 3rd and 4th at the Central Lions Seniors Centre at 11113-113 Street NW Edmonton. The times are June 3 Saturday 10 am till 5 pm and June 4th Sunday 10 am till 4 pm. I love this quilt... tulips are my favorite flower... and I made a version of this pattern too! Great minds think alike...LOL! Your quilting really enhances this piece... great job! This is so pretty! I love the tulips, but also the scrappy sashing around them! This quilt makes me smile. Very pretty. WONDERFUL finish -- I like the windy photos! Absolutely delightful quilt, so bright and happy! I LOVE this quilt! Beautiful job. Congratulations on a wonderful finish! CUTE quilt!! Best of luck at the show. This quilt just shouts 'Spring!!!' Wonderful finish! Planning to go to that show, so I'll be sure to look for your very pretty entry!